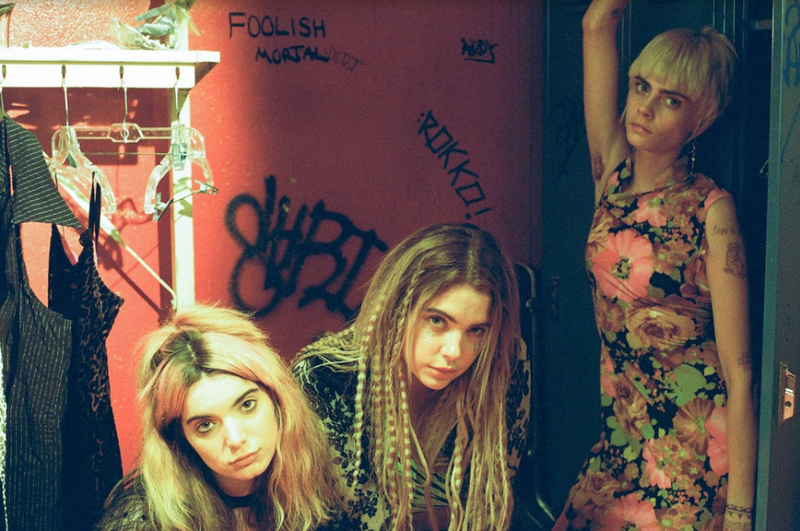 You’ve got to see it to believe it, check out the music video for “Can’t Wait” performed by The Akergirls (Cara Delevingne, Dylan Gelula, Ashley Benson), from Her Smell starring Elisabeth Moss. Her Smell is now playing in New York (at IFC Center and Nitehawk Prospect Park) and opens on April 19th in Los Angeles, Chicago, Washington DC, San Francisco, Austin, Dallas-Fort Worth, Baltimore, Portland. Becky Something (Elisabeth Moss) is a ’90s punk rock superstar who once filled arenas with her grungy all-female trio Something She. Now she plays smaller venues while grappling with motherhood, exhausted bandmates, nervous record company executives, and a new generation of rising talent eager to usurp her stardom. When Becky’s chaos and excesses derail a recording session and national tour, she finds herself shunned, isolated and alone. Forced to get sober, temper her demons, and reckon with the past, she retreats from the spotlight and tries to recapture the creative inspiration that led her band to success.